We visited Thomas land again this Christmas. The show was not as good as 2008, but once again we had a great time. I have now been on several days-out at Thomas land as both our children are fans of Thomas the Tank Engine and love the park. I’ve already reviewed Thomas land from the point of view of facilities and a general overview, but there are a few things I’d like to add from my recent visits. Whatever way you look at the price for visiting Thomas Land it is not cheap. How expensive it is depends upon when you visit and what special offers may be on at the time. 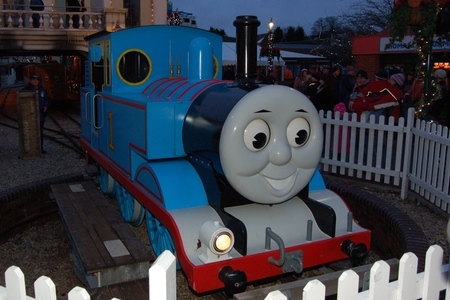 One of the reasons for Thomas Land being so expensive is that it is part of Drayton Manor theme park and so the admission price is the same as main theme park. Drayton Manor is not as expensive as some other Theme Parks (eg. Alton Towers) and is certainly far cheaper than the likes of Disneyland Paris (although Disneyland is clearly in a completely different league). If you have a young child it can be much cheaper to visit during mid-week term time. One adult and a child gets in at a much reduced price. In our case we had to pay full price for the second adult. It did mean that I was able to go on a couple of the normal adult theme park rides, but I only managed a couple of those rides which didn’t really justify the extra £15 or so. Cheaper tickets are also available at Christmas and during some other school holidays when the rest of the park is closed. Children under two are free, but there is only a small reduction for children over the age of two compared with the full adult price. You do get a lot included in the park which could cost more if you tried to do the same elsewhere. The following are all included in the price of the ticket to the park depending upon when visiting. Some of these could cost up to £10 per person if they were elsewhere (eg. the train rides and zoo). Using this the price seams to be much more reasonable, although if purchased at other venues then you’d get several days-out rather than one at Thomas Land. It’s also the case that the opening times are less on certain days. At Christmas it was open from lunch time with some rides closing at 4.30pm and the rest about 6pm. On a cold winters day that is long enough, but it is another factor to consider. At the end of the day if your children enjoy it then it is worth paying the money. We believe so as we have been on several visits, although most of our visits were when there was some kind of discount / cheaper tickets available for some of us at least. When we visited the Christmas at Thomas Land event in 2008 there was a circus style stage show which was really good. It did mean that you had a ticketed time when you had to go to see the show, but it was well worth it. 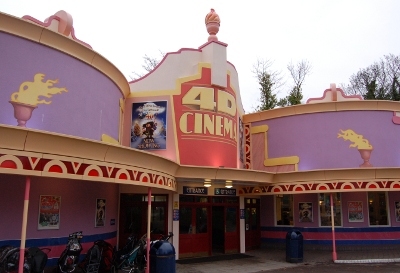 During Christmas 2009 this had been replaced with the 4D cinema which was a little disappointing in comparison. The 4D cinema is still good, but it’s not the same as having the live show. During both Christmas events there was also a live show on each hour at the stage by the station. This was a short sing-a-long from the character staff such as Sir Topham Hatt (Fat Controller), Clown and Santa (during 2009 – during 2008 Santa was in the main show). During normal peak time there is a circus show included within the main Drayton Manor theme park. There are two trains which take passengers between the two Thomas Land areas / Zoo. Originally these were Thomas and Percy, but for 2009 Rosie was used in place of Percy (except at Christmas which was Percy). Percy is one of the classic engines, but Rosie is a pink coloured engine which is popular with girls. The Thomas and Friends Exhibition is a new feature for 2009. 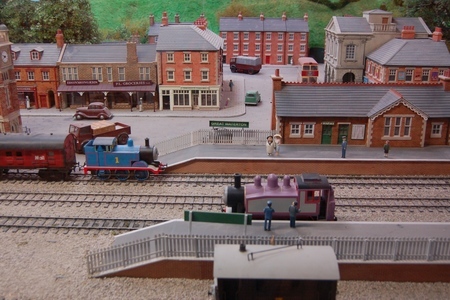 It is a static display of the actual sets used to film the TV series. To get to the exhibition you have to go through the Children’s farm so it is easy to miss if you don’t look on the map / see the signs. Some people seamed to be surprised that it was not a moving train set. I overhead comments saying that they don’t know why it’s not “working”, despite signs saying it was a static display. It is however good to see the original set to get an idea of how much set is created for some of the scenes. I liked the exhibition. It is not cheap to visit Thomas Land, but I’d recommend it for anyone whose children like Thomas the Tank Engine. Our children both love going to the park. The only think is that there is too much to cram into a single day. This entry was posted on Monday, January 4th, 2010 and is filed under Babies, Children, General, Tourism. You can follow any responses to this entry through the RSS 2.0 feed. Both comments and pings are currently closed.